After the first velvety- melt-in-your-mouth bite of tonkatsu at Maisen, I finally realized what all the fuss was about, and I vowed that I would never attempt to cook this myself, because no matter how hard I try, my version would never in a million years, be as decadent and delicious. During our first visit to Maisen, I ordered the Tenderloin Katsu set, which comes with small side dishes, shredded cabbage and miso soup. My friend ordered hers with a side of curry. We also decided to share a serving of tamagoyaki. There are three sauces that are available at the table. There is a sweet sauce, spicy sauce and a spicy salt. There is also some sesame dressing for the shredded cabbage. Don’t worry if you can’t remember which sauces are which, because the service staff always helpfully reminds you. The side dishes arrive first, and they are always a bit different each time. The servings are quite dainty, and just lightly flavored. This was followed by the tamagoyaki. I’ve only ever had tamagoyaki cold before, so it was a pleasant surprise to try the hot off the pan version. The warm version is delicious, almost like a warm, savory custard. Then our tonkatsu arrived soon after. As imagined, the bread crumb crust was feather light and crispy, and the pork was tender and juicy, and practically melted like butter. The curry on the side was salty, and to be honest, really paled in comparison to tonkatsu. The shredded cabbage is refillable as many times as you like, and the waiter will come around quite frequently to top off your plate. 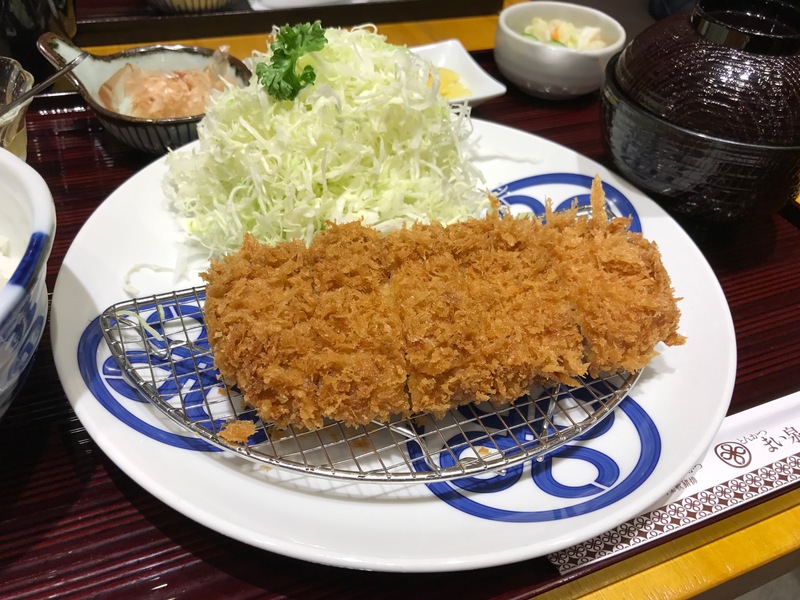 After that meal, we knew we could add Maisen to our regular roster of restaurants, because the location is convenient, the surroundings are comfortable, and of course, the tonkatsu is always predictably delicious. My advice is to just order the tonkatsu set (the tenderloin if you like a softer texture, and the loin if you like a chewier texture) which is satisfying in itself. That way after dinner, you’ll still have room for dessert. This entry was posted in Uncategorized and tagged Japanese cuisine, tonksatsu. Bookmark the permalink.